I missed the Oscars and the surprise finish, but the next day I saw this clip of Jimmy Kimmel surprising a tour bus full of people hoping to make a sighting of a real movie star. 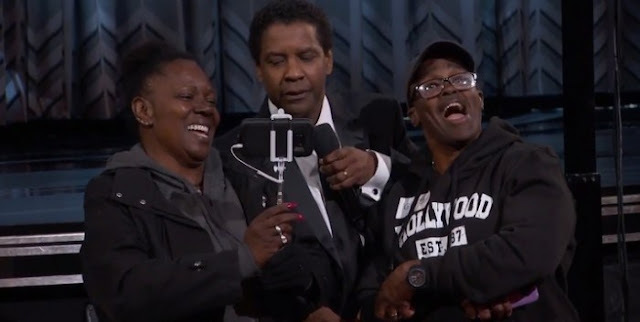 They came in the room and found themselves in the front row of the Oscars. Something about the clip annoyed me and I couldn’t quite put my finger on it. Then I realized how many of the tourists (and movie stars) held their phones in front of their faces. I could barely see their reactions because all I saw were rectangles with lenses in the corner. So, here we have a group of people who presumably like movie stars, after all that is why they were on the bus for a tour of stars homes. They suddenly find themselves face to face with the people they desperately want to see and yet they put a phone up to block their real view. Seeing these stars through a camera lens and recording something that was already on camera was more important than putting the phone away and interacting with a real person. It is a strong indication of how phone/camera/video technology has permeated our lives. The point of me bringing this up is not to criticize the tourists. I certainly do not know how I would react if I suddenly walked onto the set of the Oscars. “Stupefied” is a word that comes to mind. No, all in all, I think they handled themselves quite well. I bring this up because it reminds me of something that easily infiltrates our lives to the same extent as phone technology. I am talking about fear. Fear walks around in our back pocket and is pulled out when examining any new information. It becomes the lens through which we see the world. We understand politics based on what politicians tell us to fear. We must do this or else something worse will happen. Fear makes it okay to hurt others as long as we can justify it with the promise of safety. However, because this is the world that is an empty promise making the pain we cause less than justified. We view our lives through the fear of the “what ifs” that lurk in the corners of our heart. We see our relationships through the fear of wondering if we can really trust, if we really know what someone is thinking, if we can really rely on this person. We view our past, present, and future through fear also. It is bad enough when our leaders convince us to act out of fear, but it is truly devastating when fear keeps us from seeing our God. My study Bible calls these words an exhortation. That puts it substantially above a “suggestion” and well into the “urgent persuasion” category. God is with us, we do not need to fear. In fact, we are not to indulge in fear. God is stronger than our worries. He is stronger than our mistakes. He is stronger than anything that can harm us. And He is stronger than the politicians who hold power over us when they convince us to be afraid or angry. We are safe. We are saved. We are perfectly loved. Take your fear out of your pocket and throw it away. There is no room for fear in our lives or in our faith. We have a Savior.